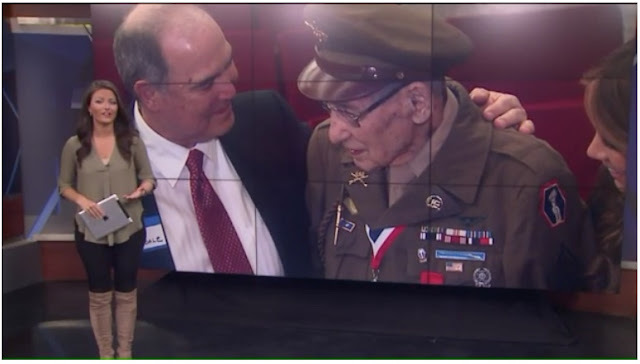 GRAND RAPIDS, Mich.-- A World War II veteran who was stripped of his medals nearly 75 years ago was repinned on Saturday. Virgil Westdale was part of the most decorated battalion in military history: the 442nd Regimental Combat Team, after he was stripped of his Army Air Corps badge during the war because he was a Japanese-American. Westdale had his pilot's license taken away and was demoted to a Private in the Army. 75 years later, Westdale got his wings back, along with a celebration of his 100th birthday. It was a moment decades in the making that many say never needed to happen. "It was the restoration of his Army Air Corps Badge," said Lt. Col. Steve Kenyon. "That is 75 years after it was wrongfully taken away from him, so it's a pretty big deal."